So as soon as I'd cast off the last stitch, darned in the last end, she packed them up in her rucksack and took them to camp. Or, to be more accurate, since I managed two pairs, she put the blue and navy ones on her feet, which were stuffed, then, into her wellies, and she packed the stripey ones for emergencies. On Friday night we took her to the drop-off point and the latest news we have is in a forlorn text this morning which tells us that pick ups might be earlier than originally planned. We're used to that round here. It's a rain thing. I hope her feet have stayed warm, because I was pleased that she had agreed to play along when I had suggested special camping socks. I would have saved their details for a memo this Monday; but, new thing as they are, I can't count them as a weekend innovation if, by Friday night, they were in a field, in a sleeping bag, under canvas. All the same, they are the first heavy duty socks I have produced, with (UK term) double knitting wool from West Yorkshire Spinners - I love this wool, it seems to help my stitches come out more neatly and more ordered - and a new toe style which achieves a chic little raised line along each side of the top of the foot. I'll definitely be using it again. 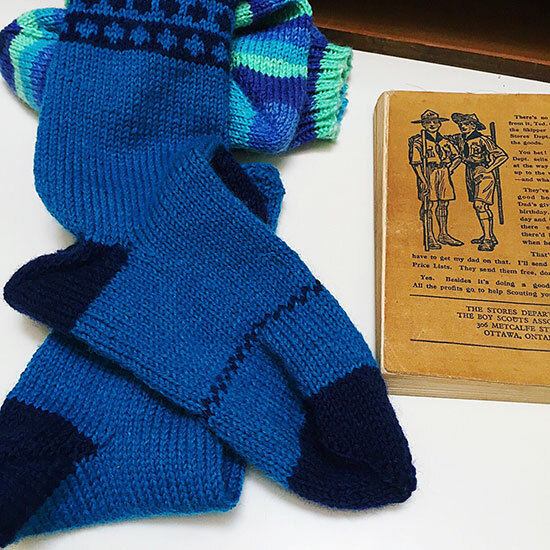 I had started with a pattern from ravelry; but - lesson learned - I now know that just because it has a cute name, a persuasive picture and a set of instructions that doesn't mean my downloaded pages hold the secret to an excellent well fitting sock. So I tried again and made it up as I went along (though some of the colourwork pattern comes from Folk Socks by Nancy Bush. Then I wrote it all down in my sock notebook. Maybe what I need now is a cute name? For socks to help you camp in a field in the wet and cold, in a tent? How about the "No Need TO Take Them Off At Bedtime Socks"? That's June Sock of the Month. Well done! Lovely patterns & colours- no name ideas here. Except the top one looks like a battlement & since she's battling the elements...maybe Battle!!! They are cute - but the name needs work! How about "Got Me Some Campy Blues"? Fabulous socks! I still haven't tried to make them!! Lovely socks; I love the patterns and the colors! I think you'll be able to write your own sock-knitting technique book soon! I think she will be the envy of the whole camp especially with this miserable June weather we are all having. I think you might find you have a list of orders from the whole camp for a pair when she gets back. I am tempted to ask to be put on the end of that list. Imagine how blissful they would be in my walking boots! What a shame the camp has been cut short .. So many events this weekend have been "dampened"by the weather! Have a good week! These look wonderful - such lovely colours and what could be warmer than a wool sock. I expect the knowledge that they were knit with love by her Mum kept her heart warm too :). Wjust look at the way you've incorporated that logo, absolutely brilliant! We had similar weather here too, we were supposed to be 'dog sitting' and having my niece's dog for a sleepover while they went camping. Thunderstorms cancelled their plans so we still don't know how Coco would have taken to another dog in the house overnight. Did we maybe have a lucky escape?! They are very lovely! The Boy Child might suggest 'Sick Socks', with the term sick being used to signify marvellousness! 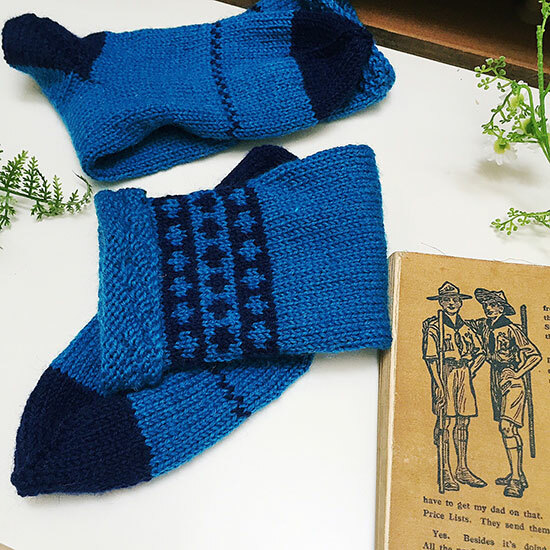 These do look like perfect camping socks! Camping in the rain sounds downright miserable - at least the socks were bright and cozy! Hope they did a good job in keeping her feet dry and she had a good time.